Janet Biggs, a 2018 John Simon Guggenheim Foundation fellow, is known primarily for her work in video, photography and performance. She lives and works in Brooklyn, New York. Biggs' work focuses on individuals in extreme landscapes or situations and often navigates territory between art and science. She has captured such events as kayaks performing a synchronized ballet in Arctic waters and sulfur miners inside an active volcano. Recent projects have explored the creation and loss of memory from personal, physical, and scientific perspectives. Biggs’ work has taken her into areas of conflict in the Horn of Africa and to Mars (as a member of crew 181 at the Mars Desert Research Station). She has collaborated with neuroscientists, Arctic explorers, aerospace engineers, astrophysicists, Yemeni refugees, and a robot. In addition to videos, her recent work includes multi-discipline performances, often including multiple large-scale videos, live musicians, and athletes. Biggs has had solo exhibitions and film screenings at the Museo de la Naturaleza y el Hombre and the Museo de la Ciencia y el Cosmos de Tenerife; Neuberger Museum of Art; SCAD Museum of Art; Blaffer Art Museum; Musee d'art contemporain de Montréal; Hirshhorn Museum and Sculpture Garden; Tampa Museum of Art; Skulpturenmuseum Glaskasten Marl; Herbert F. Johnson Museum of Art; and the Mint Museum of Art; among others. Biggs is the recipient of numerous grants and awards including the 2018 John Simon Guggenheim Foundation fellowship, the Electronic Media and Film Program at the New York State Council on the Arts Award, the Arctic Circle Fellowship/Residency, Art Matters, Inc., the Wexner Center Media Arts Program Residency, the Anonymous Was a Woman Award, and the NEA Fellowship Award. Her work is in collections including La Collezione Videoinsight®, Turin, Italy; Fonds Régional d'Art Contemporain (FRAC), Languedoc-Roussillon, France; Zabludowicz Collection, London, England; the Tampa Museum of Art, Tampa, FL: the High Museum, Atlanta, GA; the Herbert F. Johnson Museum of Art, Cornell University, Ithaca, NY; Mint Museum of Art, Charlotte, NC; and Gibbes Museum of Art, Charleston, NC. ; and the New Britain Museum of Art, New Britain, Connecticut. Janet Biggs works with Cristin Tierney Gallery, New York City, Analix Forever, Geneva, Switzerland, CONNERSMITH, Washington, DC,, Hyphen Hub, New York, NY, Galerie Anita Beckers (Blink Video Art), Frankfurt, Germany. Kawah Ijen, Conner Contemporary Art, Washington, D.C.
Arctic Trilogy. Presented as part of the Environmental Film Festival at the Hirshhorn Museum, Washington, D.C.
Tracking Up, Solomon Projects, Atlanta, Georgia. Like Tears in Rain, Gibbes Museum of Art, Charleston, South Carolina. She Devil, Museo D'Arte Contemporanea Roma, Italy. VIDEONALE.13, Kunstmuseum Bonn, Bonn, Germany. Miami International Film Festival. Included in “Cutting the Edge” category. Miami, Florida. Experimental Video and Synchroswim, presented by The Rubell Family Collection + Conner Contemporary Art, Capitol Skyline Hotel, Washington, DC. Chimera, curated by Chris Bors and Ketta Ioannidou (Triton Gallery), Envoy Enterprises in New York City, and Arcade Experimental Art Projects / Stoa Aeschylou in Nicosia, Cyprus. Hollywould ..., Freewaves 11th International Festival of New Media Arts, Los Angeles. Young Identities (part of European Media Art Festival). Kunsthalle Dominikanerkirche, Osnabrueck, Germany. Water, Carroll Square Gallery, Washington, DC (June-August 2008). Video Screenings, Sara Meltzer Gallery, New York City (June 6th 2008). Curated by Laura Parnes. Stone Canoe No. 2, Delavan Art Gallery, Syracuse University, Syracuse, New York. Keeping Up With the Jones, Schroeder Romero Gallery, New York City. Infinitu et Contini: Repeated Histories, Reinvented Resistances, Smack Mellon, Brooklyn, NY. Lumen Eclipse, outdoor video installation, Cambridge Square, Boston. Stop. Look. Listen: An Exhibition of Video Works, Curated by Andrea Inselmann, Herbert F. Johnson Museum of Art, Cornell University, Ithaca, New York (October 13-December 23, 2007). Traveling to the Haggerty Museum of Art, Marquette University, Milwaukee, WI (October 23, 2008 – February 22, 2009). North Sea Film Festival for Underwater Movies, the Hague, Netherlands. (30 November - 2 December, 2007). Contemporary, Cool and Collected, Mint Museum of Art, Charlotte, North Carolina 20 Oct - 20 Dec, 2007). Loop Video Art Fair, Barcelona, Spain (31 May - 2 June 2007). Antennae, Houston Center For Photography, Houston, Texas. (27 April - 3 June 2007). What F Word?, Cynthia Broan Gallery, New York City. Curated by Carol Cole Levin. METU Video Festival, Middle Eastern Technical University, Ankara, Turkey. Helios Oceanus, Curated by Lee Wells for M21--The Museum of 21st Century Art, Gansevoort South, Miami Beach, Florida. Claire Oliver Gallery, New York City. FATHOM, Hatton Gallery, University of Newcastle, U.K.
Artists Pick, Exhibition at Larissa Goldston Gallery, New York City. Georgia State University Gallery. January - February, 2004. DiverseWorks, Houston, Texas. March - April, 2004. Video X, Momenta Art, Brooklyn, NY. Home Grown, Linköpings Konsthall Passagen, Sweden. Venden Varassa (Dominated by Water), Vantaa Art Museum, Finland. Elaine L. Jacob Gallery, Wayne State University, Detroit (January 2003 - March 2003). Santa Fe Art Institute, Santa Fe, New Mexico. November 22, 2003 - January 4, 2004. New York, New Work, Now!, Currier Museum of Art, Manchester, NH. September 28, 2002 – January 13, 2003). Curated by Nina Felshin. Kunstsammlungen, Chemnitz, Germany (May 5-- June 30, 2002);. Serious Fun. Castle Gallery, The College of New Rochelle, December 2002 – March 2003. Arrested Development: Contemporary Contemplations on Youth Culture. Curated by Susan Canning. Residuum. Cheryl Pelavin Gallery, New York, New York. Objects in Mirror Are Closer Than They Appear. Team Gallery, New York. Horse Tales: Two Centuries of American Cultural Icons. Katonah Museum, Katonah, New York. Objects That Flicker, Solomon Projects, Atlanta, Georgia. Horse Show, Site Gallery, Sheffield, England. human/nature. Caren Golden Fine Art, New York City. Curated by Jane Harris. "Six Signals: Video Art by Contemporary Artists," Cheekwood Museum of Art, Nashville, Tennessee. Object Lessons: Selections from the Robert J. Shiffler Foundation. Columbus Museum of Art, Columbus, Ohio. Curated by Annegreth Nill. Here Kitty Kitty, Nexus, Atlanta, Georgia. BuSpar (part of Horse Play), Real Art Ways, Hartford, Connecticut. Curated by Barry Rosenberg. The Comforts of Home, Hand Workshop Art Center, Richmond, Virginia. Trace, Flip Side Gallery, Brooklyn, New York. Freudian Slips, Saks Fifth Avenue, New York City. Zingmagazine Video Project, Basel Art Fair. Basel, Switzerland. Recursion: Janet Biggs, Neil Goldberg, Alix Perlstein, Linda Post, Flipside Gallery, Williamsburg, Brooklyn. Curated by Nurit Newman. Installation 7: Conceptual Art, 1989-1995. Cheekwood Museum of Art, Nashville. Curated by Barry Rosenberg. Presumed Innocence, Anderson Gallery, Virginia Commonwealth University, Richmond, Virginia. Curated by Jean Crutchfield. Catalog. Travelling through 1998: Cinncinati Contemporary Art Center. Girls and Horses (part of Family/PostFamily, m.a.p. :media art project 1997), Vantaa City Museum, Finland. Catalog. Romper Room, Diverseworks, Houston, Texas. The Gaze, Momenta Gallery, Brooklyn, New York. Curated by Laura Parnes. Catalog. Romper Room, Thread Waxing Space, New York City. Curated by Danielle Chang. Catalog. B.A.B.Y. Curated by Jan Riley. Catalog. Virginia Beach Arts Center, Virginia Beach, Virginia. Kickstart, Anna Kustera Gallery, New York City. Embeddeded Metaphor, September 1996 - December 1999, a traveling exhibition organized by Independent Curators International, New York. Curated by Nina Felshin. Subversive Domesticity, Edward A. Ulrich Museum of Art, Wichita State Univ., Kansas. Curated by Dana Self. Catalog. Cleveland Center for Contemporary Art. Incestuous, Thread Waxing Space, New York City. Curated by Carter Kustera. Separating Self: Art About Identity from the Robert J. Shiffler Collection. New Harmony Gallery of Contemporary Art, New Harmony, Indiana. Chassie Post Gallery, New York City. (Two-person exhibition). Galleria Civica di Padova, Italy. Curated by Teresa Macri and Francesca Alfano Miglietti. Wary Still, Highways Exhibition Space, Santa Monica, California. Night Light Room (Project room installation, part of Family Ties show), P.P.O.W. Gallery, New York City. Forms of Address, San Francisco Art Institute, San Francisco, California. Catalog. Regional Identity and Cartography Representation, Pigorini Museum, Rome, Italy. Catalog. Josh Baer Gallery, New York City. (Two-person exhibition). Fall From Fashion, Aldrich Museum of Contemporary Art, Ridgefield, Connecticut. Catalog. From the Collection of Robert J. Shiffler, Cincinnati Contemporary Art Center, Cincinnati Ohio. Catalog. I Am the Enunciator, Thread Waxing Space, New York City. Curated by Christian Leigh. Josh Baer Gallery, New York City. Kunsthall, New York City. Curated by Christian Leigh. White Columns Gallery, New York City. Shared Skin: Sub-Social Identifiers, Dooley Le Cappellaine Gallery, New York City. Organized by Janet Biggs. Catalog. Four Walls, Brooklyn, New York. Wei, Lilly, "Janet Biggs: Like Walking on Mars." Studio International, 20 December 2018. Jurakic Ivan: "Admit Everyone: Echo of the Unknown, Janet Biggs." Exhibition brochure. UWAG: University of Waterloo Art Gallery, Waterloo, Ontario, Canada, November 3 - December 17, 2016. Janet Biggs: Echo of the Unknown. Exhibition catalog. With essays by Janet Phelps, Barbara Polla and Jean-Philippe Rossignol. Catalog to accompany an exhibition at the Blaffer Art Museum, University of Houston, January-March 2015. Body Memory, Topographie de l'art, Paris, France, July 2015. Catalogue for the 1st International Biennal of Contemporary Art, Cartagena de Indias, Colombia, May, 2014. No Limits: Janet Biggs. Survey exhibition catalog. Essays by Berta Sichel, Todd D. Smith, Andrea Inselmann, Nancy Princenthal. Tampa Museum of Art, October 2012. Videonale.13 Festival for Contemporary Video Art. Exhibition catalog. Editor: Georg Elben. Essay: Dirk Rustemeyer. Bonn, Germany, 2011. Janet Biggs: Going to Extremes. Vantage Point IX Exhibition Catalog. Carla M. Hanzel, Curator, essay: Nancy Princenthal. Mint Museum of Art, Charlotte, North Carolina. November 2010. European Media Arts Festival, Osnabrueck 2008. Contemporary Cool and Collected. Carla M. Hanzel, Curator, essay: Robert Hobbs. Mint Museums, Charlotte, North Carolina. September 2007. Dwellan. Exhibition Catalog. Editor: Marit Ramsing, essay: Kristine Kern. Charlottenborg Exhibition Hall, Copenhagen. 2004. Norms and Forms. Exhibition Catalog. Essay: Brian Wallace. the Galleries at Moore. Moore College of Art and Design. 2004. Morales, René: "Videos in Progress: Janet Biggs." Exhibition essay. Rhode Island School of Design Museum. May, 2004. PG-13 -- Male Adolescent Identity in a Video Culture: Video Work by Janet Biggs and Barbara Pollack. Exhibition Catalog. Essay by Linda Yablonsky. Georgia State University Ernest G. Welch School of Art & Design Gallery, Atlanta, Georgia and DiverseWorks, Houston, Texas. Isaak, Jo Anna: “H20.” Exhibition catalog. Hobart and William Smith Colleges Press, Geneva, New York, 2002. Inselmann, Andrea: “Janet Biggs.” Exhibition catalog. Herbert F. Johnson Museum of Art, Cornell University, Ithaca, New York, August, 2002. Wally, Barbara: "Aquaria: The Fascinating World of Man and Water." Exhibition catalog. Stadtwerke Chemnitz Ag, February, 2002. Smith, Todd: "Verge: Janet Biggs." Exhibition catalog. Plains Art Museum, Fargo, North Dakota. July, 2001. Horse Tales: American Images and Icons. Exhibition catalog. Katonah Museum of Art, Katonah, New York. Preface by Verlyn Klinkenborg. Essays by Ezra Shales, Susan H. Edwards, and Deborah Bright. 2000. Harris, Jane: “Flight: Janet Biggs.” Exhibition brochure. Wesleyan University, Middletown, Connecticut. February, 2000. Inselmann, Andrea: "Up Downs." Exhibition brochure. John Michael Kohler Arts Center, Sheboygan, WI. 1999. Mettlesome & Meddlesome: Selections From the Collection of Robert J. Schiffler. Exhibition catalog. Cincinnatti Contemporary Arts Center. Foreword by Center Director Elaine King, introduction by former Center Curator Jan Riley, essay by New Museum Director Marcia Tucker, statement by Robert Shiffler. 1998. Presumed Innocence. Exhibition catalog. Forward by Jean Crutchfield, Essays by Robert Hobbs and Kathryn Hixson. Published jointly by the Anderson Gallery and the University of Washington Press, 1997. The Gaze. Exhibition catalog. Momenta Art. Essay by Jan Avgikos, preface by Laura Parnes. 1997. Felshin, Nina: Embedded Metaphor. Exhibition catalog. Independent Curators; ISBN: 0916365484, January, 1997. B.A.B.Y. Exhibition catalog. Hand Workshop Art Center and the Virginia Beach Center for the Arts. Essay by Jan Riley. 1996. Porges, Maria: "Forms of address : the 113th Annual Exhibition." Exhibition catalog. Walter/McBean Gallery, San Francisco Art Institute : Lynn Aldrich, Janet Biggs, Jean LaMarr, Julian Lang, Canan Tolon : October 6-November 13, 1994. Colley, Robert, editor: Stone Canoe, A Journal of Arts and Ideas from Upstate New York, No. 2. University College of Syracuse University, Spring 2008. Pierson, Melissa Holbrook: Dark Horses and Black Beauties: Animals, Women, A Passion. W.W. Norton & Company, August, 2000. Pallingston, Jessica: Lipstick. St. Martins Press, January 1999. Scanlan, Lawrence: Wild About Horses. HarperCollins, New York, 1998. Landers, Theodore A.: Career Guide to the Horse Industry. Thomson Delmar Learning, December, 2001. Hirsh, Faye: A Crystal Grotto. Art in America, October 2015. Byrd, Cathy: "Janet Biggs." Fresh Art International, Volume 2, September, 2015. Wei, Lily: "Art Made in Harm's Way." Artnews, April 2015, page 42. Peiffer, Prudence: Janet Biggs. ArtForum, 09 Feburary 2015. Wei, Lilly: Janet Biggs. Studio International, 13 February 2015. Merrill, Leila: Alzheimer's Researcher Influenced Art at UH. Houston Chronicle, 09 February 2015. Pohl, John, Review of show at Musee D'art Contemporain De Montreal. Montreal Gazette, 12 October 2012. “The Otherworldly Beauty of the Worst Job Ever.” Canadian Art Junkie, 10 October 2012. Raine, Emily: “Q&A With Janet Biggs.” Cult, 09 October 2012. Tousignant, Isa: “Janet Biggs at the Musee D'art Contemporain De Montreal.” Akimbo, 09 October, 2012. Clément, Éric: “Pierre Dorion et Janet Biggs au MAC: dévoués aux espaces.” lapress.ca, 06 October 2012. “Pierre Dorion and Janet Biggs exhibit at the Musée d'art contemporain de Montréal.” artdaily.com, 06 October 2012. Pottiez, Victoire: “Peinture et vidéo s’entrelacent au MACM.” pieuvre.ca, 06 October 2012. Pearson, Meghan: “Abstract and Extreme Exhibitions.” The Exit, 05 October 2012. Roffino, Sara, “MontréalBrooklyn Program Creates Cultural Exchange Between Two Hipster Cities.” Artinfo, 01 October 2012. “Janet Biggs’ erste Europa-Schau in Marl: Faszination trifft auf Schrecken.” Dattelner Morgenpost, 14 September 2012. Thoing, Sebastian: “Randsucher in Marl: Ausstellung von Janet Biggs.” Ruhr-Lippe-Marktplatz.de, 13 September 2012. Miller, Shauna: On the Spot: Janet Biggs. expressnightout.com (from the Washington Post.). 21 March 2012. Byrd, Cathy: Review of No Limits: Janet Biggs at the Tampa Museum of Art. 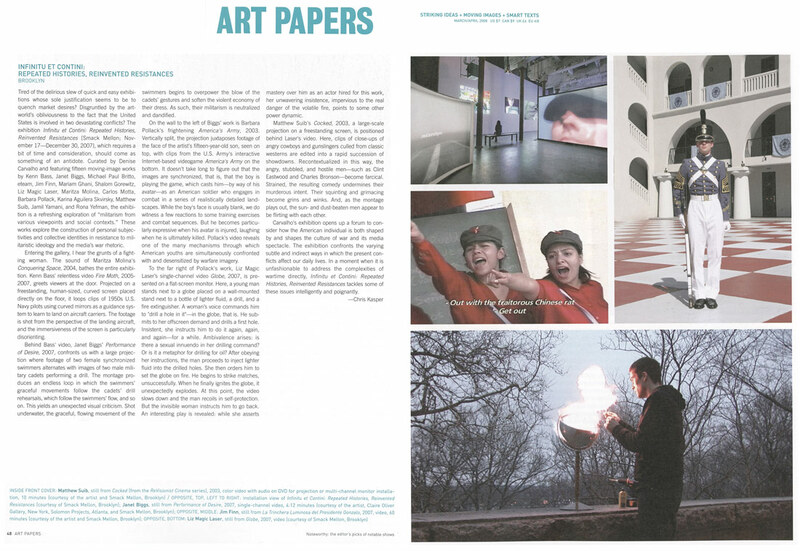 Art Papers, January/February, 2012. Bennett, Lennie: Conjecture key to comparison of Janet Biggs' video works at Tampa Museum of Art. St. Petersburg Times, 23 October, 2011. Finch, Charlie: Wetness Invisible. Review of Wet Exit performance. Artnet.com, 1 November 2011. Pollack, Barbara: “Janet Biggs.” Art in America, May 2011. Carter, Holland: Review of show at Ed Winkleman Gallery. The New York Times, 17 February 2011. Rifkin, Mark: “TWI-NY Talk: Janet Biggs.” This Week in New York, 9 March 2011. Finch, Charlie: “Coal Miner’s Daughter.” Artnet.com, 25 February 2011. Sutton, Benjamin, “Exploration Art: Janet Biggs and Duke Riley Scout Forgotten Islands and Dark Tunnels.” L Magazine, 28 February 2011. Pollack, Barbara: Review of show at Conner Contemporary Art. ARTnews, November 2010. Wennerstrom, Nord: Review of show at Conner Contemporary Art. ArtForum, October 2010. Finch, Charlie: White on White. Artnet, 21 June 2010. Conley, John David: "Janet Biggs on NASCAR, kayaks, and competition." Fauxrator.com, 15 June, 2010. McClemont, Doug: Best Ten Shows of 2009. Saatchi and Saatchi online magazine. January 2010. Finch, Charlie: The Harvest of Art. Artnet, 17 July 2009. Finch, Charlie: Groundhog's Diary. Artnet, 13 February 2009. Conner, Jill: Janet Biggs at Claire Oliver Fine Art (Review of Vanishing Point). Art Quips, 9 January 2009. "Janet Biggs." Review of Vanishing Point. New Yorker, 22 February 2009. This Week in New York, 21 January 2009. Fester, Felicia: Review of Tracking Up at Nancy Solomon Gallery. ArtPapers, July/August 2008. 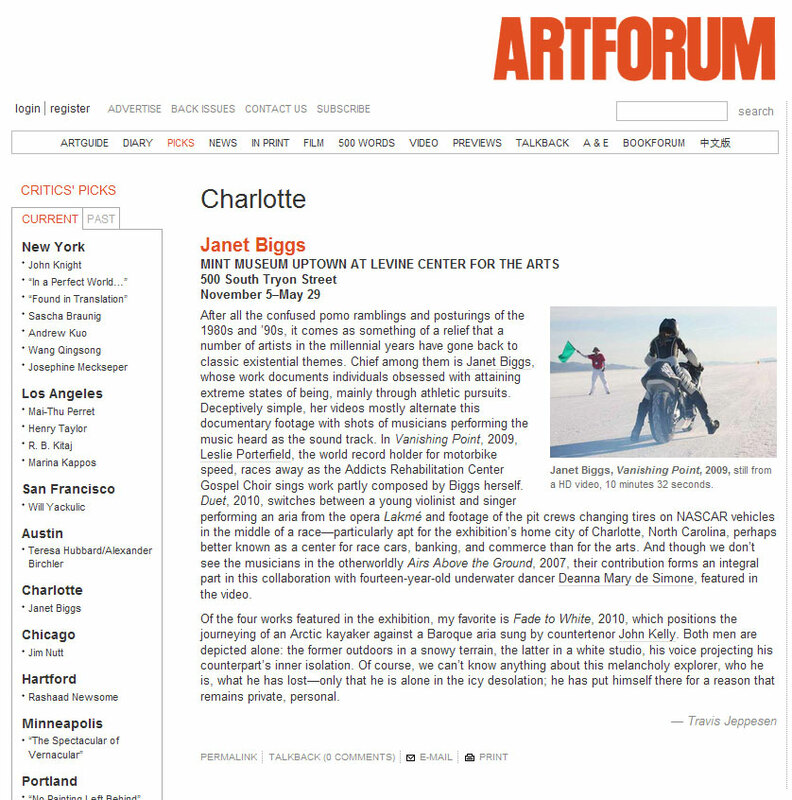 Greer, Larissa Erin: "On the Right Track: Video artist Janet Biggs gaining wider exposure." The Sunday Paper, July 13-19, 2008.
Review of Airs Above the Ground at the European Media Arts Festival. Regioartline Kunstamagazin, 4 May 2008.
Review of Airs Above the Ground at the European Media Arts Festival. mosquto, April 2008.
Review of Airs Above the Ground at the European Media Arts Festival. Hannoversche Allgemeine Zeitung, 23 April 2008.
Review of Airs Above the Ground at the European Media Arts Festival. Kunst Raum Münster, April-June 2008.
Review of Airs Above the Ground at the European Media Arts Festival. kunst:stück, April 2008. "Medienkunstfestivalim Zeichen der Jugend." Mindener Tageblatt, 28 April 2008. Jenks, Debra: "Pulp Friction - Artists explore the underside of American culture." Chelsea Now, 14 December 2007. "Keeping Up With the Jones." Review of show at Schroeder Romero gallery, The New Yorker, 24 December, 2007. Maschal, Richard: "Newly Minted: Private collectors lend their modern treasures as Mint museum starts a quest for living artists." Charlotte Observer, 19 October 2007. "Sport and Spectacle," Artkrush online magazine. 8 August 2007. Pool, Olivia: "First in State. Gibbes acquires first S.C. video art installation." The Post and Courier, 26 July 2007. Ashley, Dottie: "Like Tears in Rain. Citadel's Summerall Guards part of first video exhibit at Gibbes." The Post and Courier, 22 July, 2007. Ludwin, Torie: Review of Antennae. artshouston magazine, June 2007. Smith, Nick: "Future Noir: Janet Biggs mixed documentary shots for art's sake at the Gibbes." Charleston City Paper, 02 May 2007. Yale, Madeline: Antennae (review of group show at Houston Center for Photography). Spot Magazine, Summer 2007. Byrd, Cathy: "Janet Biggs." Contemporary, March, 2007. Li, Zhen: "Equestrians in Show Windows." Vision Magazine, Beijing, China. October, 2006. "Janet Biggs." Review of show at Claire Oliver Gallery. The New Yorker, 04 December 2006. Carr, Amanda: "Artist's Windows at Hermès, New York." Visual Merchandising, 29 September 2006. Perez, Magdalene: "Nearby Explosion Adds Extra Drama to Video Installation at Hermes." ArtInfo, 11 August 2006. Pollack, Barbara. "Horseplay." ArtNews, Summer 2006. Dunning, Jennifer: “A Horse and Dancers in an Ode to Interspecies Ties.” New York Times, 10 October 2005. Lille, Dawn: “Rules of Engagement: Dancers and a Horse.” Art Times, December 2005. Marshall, Lea: Rules of Engagement review. Dance Magazine, November 2005. Tobias, Tobi: “Rules of Engagement.” New York Village Voice, 1 November, 2005. Anderson, Jack: Rules of Engagement review. New York Times, 14 October 2005. Pollack, Barbara: “Moonlight Sonata.” ARTNews, September 2005. Gavin, Francesca: “Drowning in Newcastle.” BBC online, 21 July 2005. Jones, Sarah: review of Fathom. Metro (Newcastle, UK). 8 July 2005. Whetstone, David: “Sound Creation for World of the Deep.” The Journal (Newcastle, UK), 2 July 2005. Duff, Helen: Fathom review. Metro (Newcastle, UK). 30 June 2005. Pohl, Eva: Videopoesi på højt niveau." Berlingske (Copenhagen), 11 November 2004. Hornung, Peter Michael: "Når billedet dvæler." Politiken (Copenhagen), 9 November 2004. New York Newsday, 27 November 2004. Boston Globe, 27 November 2004. San Francisco Chronicle, 27 November 2004. Sports Illustrated, 27 November 2004. Stanford Advocate, 27 November 2004. Ms. Magazine Online, 27 November 2004. Sozanski, Edward J.: "Bodies in Motion." Philadelphia Inquirer. 4 December 2004. Streitfeld, L.P., "The Power Of UConn's Women On Display." Hartford Courant, 02 December 2004. Pollack, Barbara: “H20.” Time Out New York, 7-14 August 2003. Faingold, Scott: "Teenage Wasteland - Two artists ask how boys become men in a videocracy." Houston Press, 11 March 2004. Hirsch, Faye: “Janet Biggs at the Herbert F. Johnson Museum of Art.” Art in America, July 2003. Sohl, Lena: “USA underytan” (USA Under the Surface). Stockholm Aftonbladet, 9 May 2003. Ulmonen, Anu: “Syväsukellus mieleen ja ruumiiseen” (Deep Dive Into Mind and Body). Helsinki Sanomat, 18 January 2003. Ripatti-Torniainen, Leena: “Janet Biggsin uimari liikkuu kuin unessa” (Janet Biggs’ swimmer moves as if in a dream). Vantaan Sanomat, 19 January 2003. Höll, Von Andreas: ''Aquaria - Über die außergewöhnliche Beziehung von Wasser und Mensch. DeutschlandRadio Berlin, 5 May 2002. Lombardi, D. Dominick : Review of "Arrested Development: Contemporary Contemplations on Adolescence and Youth" at Castle Gallery, the College of New Rochelle. New York Times, 3 March 2002. Miller, Barbara: Review of Flight and BuSpar at Western Washington University. Art Papers Magazine, September/October 2001. Henning, Sarah: "A New View of Art." Fargo In-Forum, 12 August 2001. Cochran, Rebecca Dimling: "Objects that Flicker: Artists' Videos for the Home." Sculpture Magazine, June 2001. Smith, Todd D.: "Taking Art to The Verge." The Art Forum for the Visual, Performing and Literary Arts, Fall, 2001. Relyea, Kie: "Video artist circles back to WWU." The Bellingham Herald, 5 April 2001. Byrd, Cathy: Review of “BuSpar” at Solomon Projects. Sculpture Magazine, June 2000. Byrd, Cathy: “Horse of a Different Color.” Creative Loafing, 2 February 2000. Cullum, Jerry: “Emotional Equestrianism.” Atlanta Journal-Constitution, 21 January 2000. Feaster, Felicia: “Whipped.” Creative Loafing, 26 January 2000. Pollack, Barbara: “The Mane Event.” ARTnews, November 1999. Damsker, Matthew, “Next Century Vision.” Hartford Current, 5 October 1999. Thomas, Mary: "Fine Art: Seeking Shelter." Pittsburgh Post-Gazette, 22 January 1999. Williams, Gregory: Review of "Glacier Approach" and "Water Training" at Anna Kustera Gallery. Zing Magazine, Fall 1998.
Zimmer, William: "Inviting or Not, What Do Beds Mean?" New York Times, 4 October 1998. Bergman, Aeron: Review of "Water Training" at Anna Kustera Gallery. Cakewalk, Spring/Summer 1998. St. John, Mark: "Art exhibit has stuff dreams are made of." Hampton Roads Daily Press, 29 May 1998. Auslander, Philip: Review of 'Water Training' at Solomon Projects. Art Papers, March-April 1998. Rush, Michael, "Three Video Artists." Performing Arts Journal, January 1998. Yablonsky, Linda: Review of "Water Training" at Anna Kustera Gallery. Time Out New York, 11 December 1997. Forrest, Jason A.: "Learning to Ask Questions." The Journal-Constitution (Atlanta), 24 October 1997. Byrd, Cathy: Review of "Water Training" at Solomon Projects. Creative Loafing, 11 October 1997.
de St. Sauveur, Michele: Review of "Embedded Metaphor" at Ringling Museum of Art, Sarasota, Florida. New Art Examiner, March 1997. Marger, Mary Ann: 'Not-so-sweet dreams. Times (Sarasota, Florida), September, 1997. Lipsasen, Ulla: 'Perhe Murroksessa. Artmagazine (Helsinki, Finland), November, 1997. Forsblom, Arto: 'MAPin näyttely iskee ajan hermoon. Aamulehti (Finland), 27 September 1997. Lindroos, Leena: 'Perheen koko kuva esillä Myyrmäkitalossa. Vantaan Sanomat (Vanta, Finland), 19 September 1997. Marta-Terttu Kivirinta: "Kenellä on oikeus perhe-elämään?" Helsinki Sanomat, 18 September 1997. Marja-Liisa Lappalainen: "Onnea Ja Helvettiä." Ilta-Sanomat (Helsinki, Finland), 18 September 1997. Qualls, Larry: "Five Video Artists." Performance Arts Journal No. 54, The Johns Hopkins University Press, September 1996. Schwendener, Martha: Review of "Girls and Horses" at Chassie Post Gallery. Art Papers, May/June 1996. Hess, Elizabeth: "It Takes a Village." Village Voice, 26 March 1996. Halle, Howard: Review of "Girls and Horses" at Chassie Post Gallery. Time Out New York, 20 March 1996. Tanner, Marsha: Review of show at San Francisco Art Institute. Art Issues, November, 1994. DiGenova, Arianna: "Figure Erranti Oltre la Mappa del Identita Correnti." Il Manifesto (Rome, Italy). 15 June 1994. Rossi, Leena-Maija: "Lapsuuden loppu." Helsingin Sanomat. Lauantaina 29, Tammikuuta 1994. Heartney, Eleanor: "Elizabeth Berdann and Janet Biggs at Josh Baer." Art in America, May 1994. Levin, Kim: "Voice Choices." Review of show at Josh Baer Gallery. Village Voice, 28 December 1993. Raynor, Vivien: "What Do Clothes Mean to an Artist Anyway?" New York Times, Sunday, 13 June 1993. Bonami, Francesco: "Panorama NYC." Flash Art, October, 1992. Levin, Kim: "Voice Choices." Review of show at KunstHall. Village Voice, 11 August 1992. Faust, Gretchen: "New York Reviews." Review of Shared Skin: Sub-Social Identifiers. Arts Magazine, January, 1992. Lichtenstein, Therese: "Multicultural Excavations." Catalog Essay in Shared Skin: Sub-Social Identifiers. Dooley Le Cappellaine Gallery, New York City, 1991. Smith, Roberta: "The Group Show as Crystal Ball." New York Times, 6 July 1990. The Gibbes Museum of Art, Charleston, South Carolina. The Herbert F. Johnson Museum of Art, Cornell University, Ithaca, New York. The Mint Museum of Art, Charlotte, North Carolina. The New Britain Museum of Art, New Britain, Connecticut. Philadelphia Electric Company, Philadelphia, Pennsylvania. The Robert J. Shiffler Collection and Foundation, Dayton, Ohio. 2010 The Arctic Circle – High Arctic expedition residency. The Arctic Circle is administered by the Farm Foundation for the Arts and Sciences. 2010 Art Matters: Artist's Project Grant. 2010 The Arts and Science Council of Charlotte - Mecklenberg, Inc.
2009 The Arctic Circle – High Arctic expedition residency. The Arctic Circle is administered by the Farm Foundation for the Arts and Sciences. 2009 New York State Council on the Arts (NYSCA) Film & Media / New Tech Production grant through the Experimental Television Center. 2008 Experimental Television Center Finishing Funds award, supported by the Electronic Media and Film Program at the New York State Council on the Arts. 1977-1978 Experiment in International Living, Basel, Switzerland. © 2019 Janet Biggs Contact info.